The Nosh “Nano” market system is a unique franchise concept that allows franchise owners the ability to offer a desirable small micro market concept with limited risk and investment. As the only company of it’s kind in the nation, Nosh is at the forefront of micro market technology. A Nosh “Nano” market is a smaller, fully customizable version of a traditional micro market system which is a self-contained store in a location without an employee to monitor it. It's comprised of freestanding snack displays combined with glass front refrigerators, freezers and coffee stations. Instead of customers paying with an expensive self-checkout kiosk, Nosh instead utilizes its award winning Mobile Nosh Snack App as the payment platform, saving each operator thousands of dollars in hardware costs. There are 3 base Nosh market sizes. The smallest version is our Nosh Nibble countertop display. It is best suited for locations with less than 30 employees. The Nosh Bite version is perfect for larger counter tops and offices with between 30 and 50 employees The Nosh Munch is a floor-based unit and is approximately 5.5’ wide and 6’ tall. The Munch is great for locations with between 50 and 150 employees. More than 150 employees? No problem! Larger micro market build outs are available to take advantage of every size and type of location. Smaller companies are often refused snack and drink vending service because of the cost prohibitive nature of servicing small accounts with traditional vending. There are over 2 million locations such as this that fit the criteria for a Nosh market, making the opportunity endless! Nosh ensures that no location is ever left behind. Americans eat an average of 2.7 snacks per day. Micro markets tend to attract 18 percent more visits per day with an average of 1.2 sales per day per visit, as compared with 0.7 sales in a vending area. There will be 35,000 micro market locations projected by the year 2022 and they will generate $1.6 billion in revenue over the next 10 years. 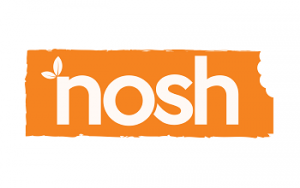 Nosh is the most simple and efficient snack food and drink delivery service on the market today. We focused on simplifying the process so our franchise owners could provide health forward snacks and drinks to their locations in the most cost effective manner possible. Why pay thousands of dollars for vending machines when you can place a state of the art Nosh market for a fraction of the cost. Employees simply download the Nosh Snack Payment App, which allows them to Scan, Pay and Enjoy! Come join the hottest franchise of 2017 and get Noshin today! Request more information below to get in contact with us. With Nosh, the training never stops. Initially, we have a mandatory 2 day training course at our corporate offices in California. Once the first training session is completed we provide daily or weekly assistance via phone, webinar, email communication and even onsite visits. Assistance is available for as long as you need it as your success equals our success. There is no additional cost for this valuable training and assistance. Training will cover location acquisition, product sourcing and nutrition, market installation and setup, remote monitoring system and how to run the day to day operations of your new business.